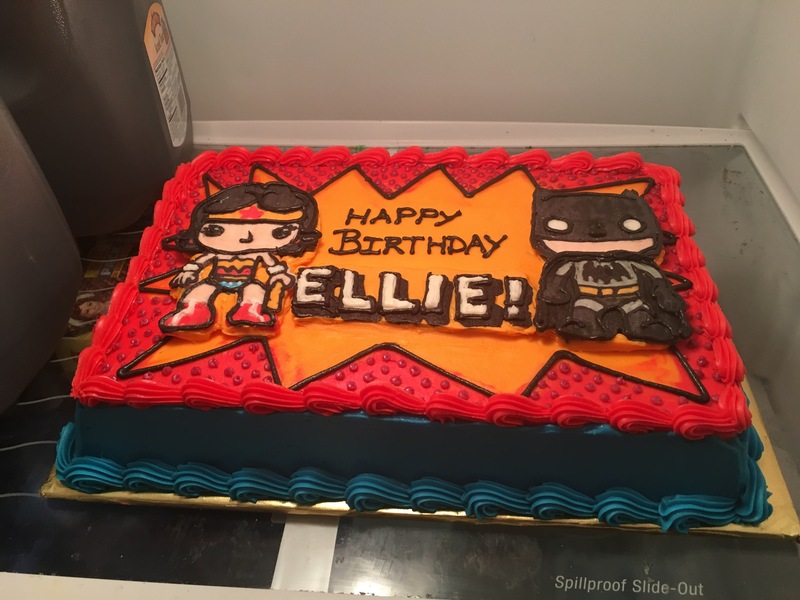 All buttercream super hero cake! So it’s Ellie’s birthday weekend again! 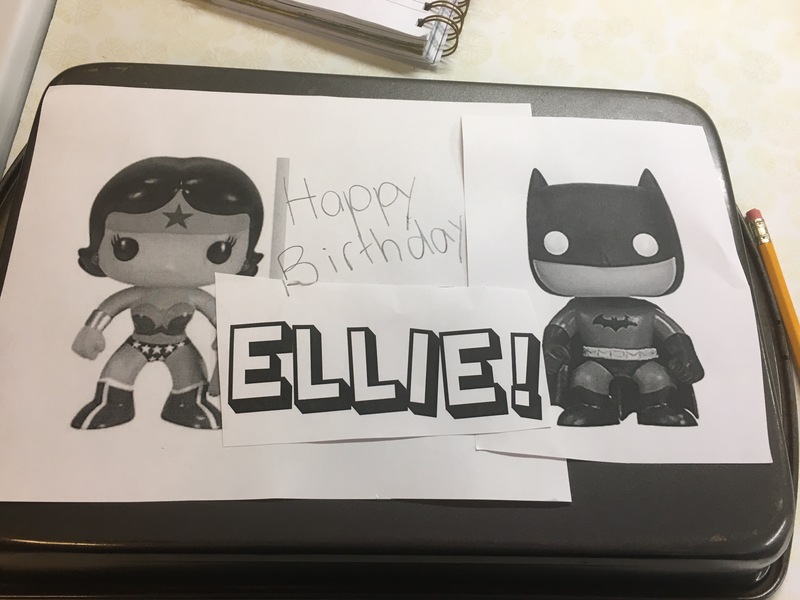 I’ve made a cake for Ellie every year for the past few years; I have lost count. This year, we decided on a Funko Pop! Theme. 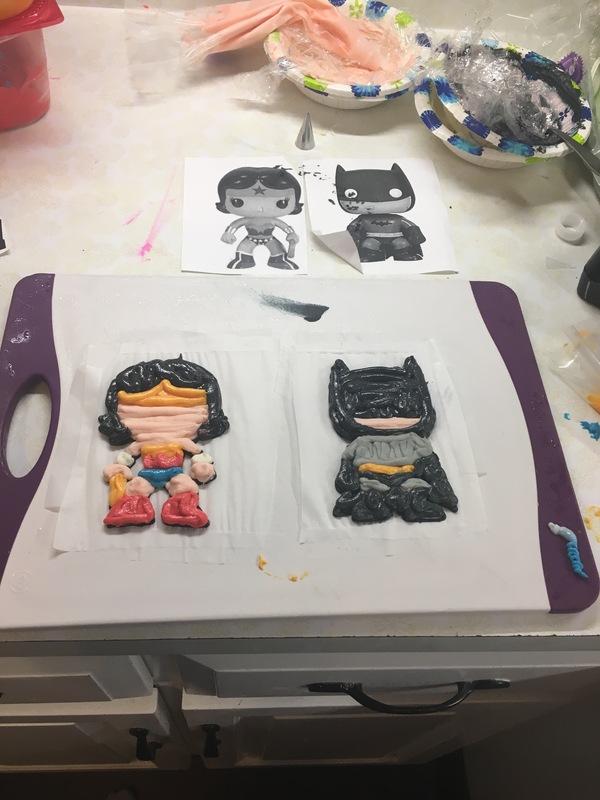 At first I was going to make them out of fondant — easy peasy. 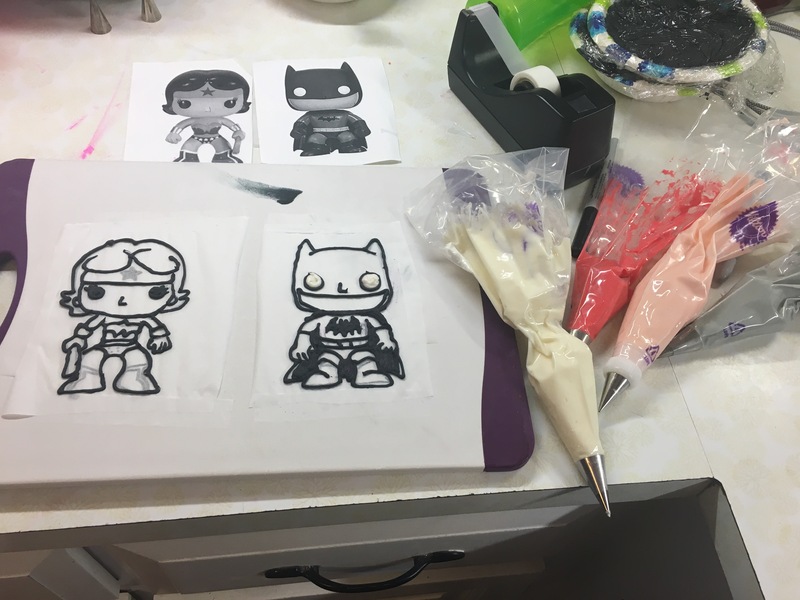 But then I decided that these figures are such basic shapes that why not trying to make something with buttercream? I have been very inspired by bakeries working in all buttercream, like Viva La Buttercream and White Flower Bake Shoppe. 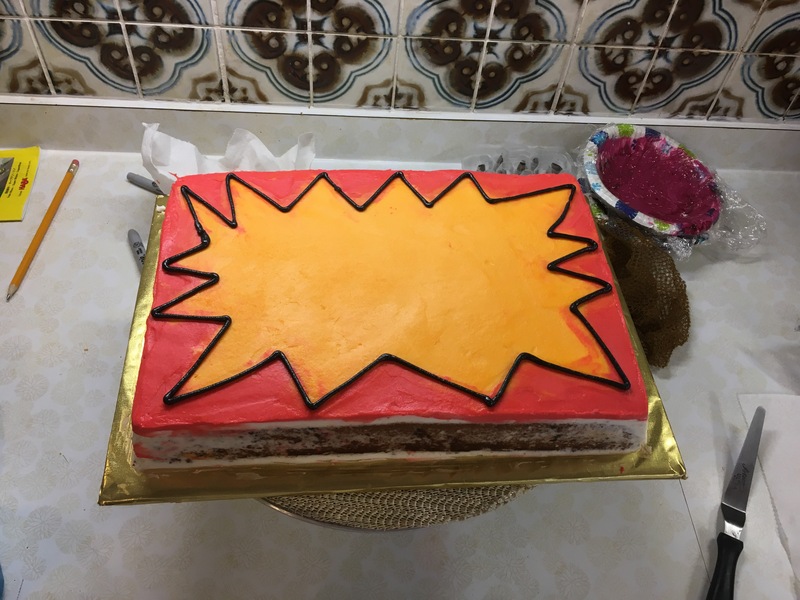 Last year, I made a Charlie Brown cake for Threadcakes and used the frozen buttercream technique, and it turned out great, so I was confident I could give it a go again. First, I need to give credit where credit is due. 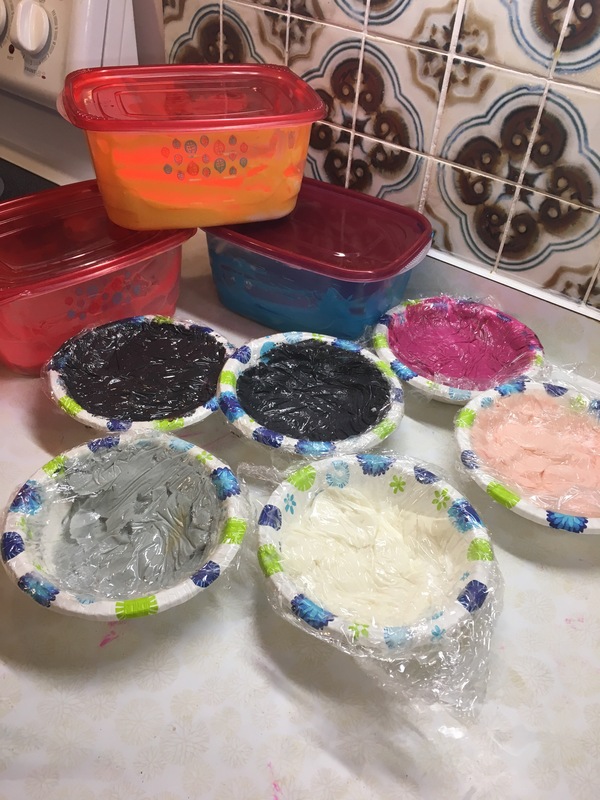 There is a great tutorial on how to make buttercream transfers by Cake Journal: https://cakejournal.com/tutorials/how-to-make-a-frozen-buttercream-transfer/ . This truly tells you all you need to know about making buttercream transfers. 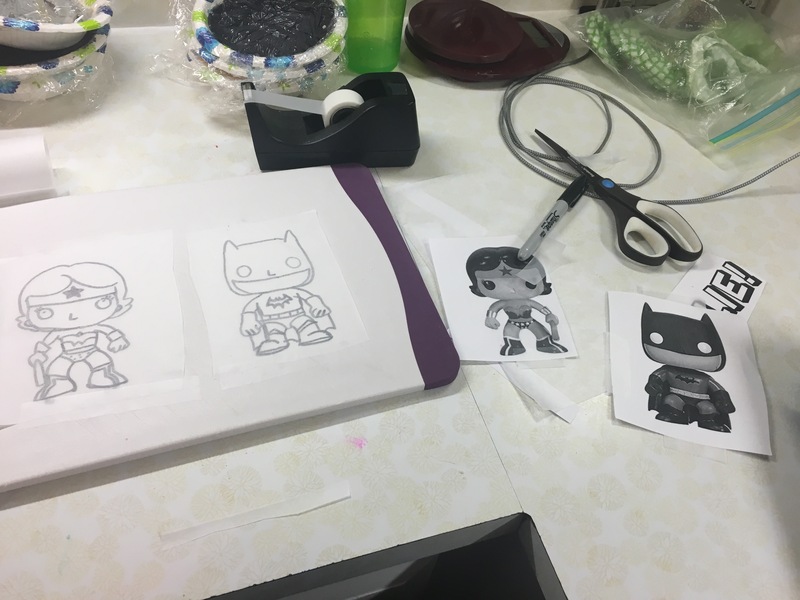 First, I looked at the characters she decided on – classic Wonder Woman and Batman. Then I gathered all my colors. Then I made 5 lbs of American Buttercream. I use Toba Garrett’s Decorator’s Buttercream recipe. 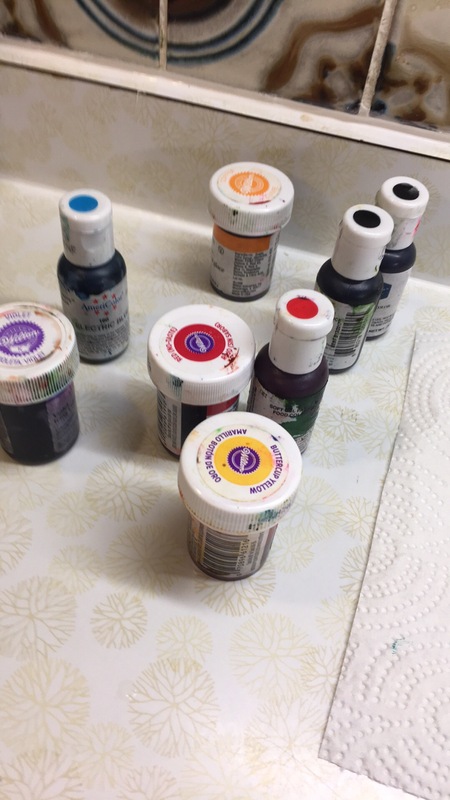 I had to guess how much of each color I needed. I traced my picture onto parchment paper and flipped it over. Then I made a bunch of bags fitted with small tips — 3, 2, and 1s. I usually avoid 1 tips because even when you sift your 10x (which I do), there tends to be clumps. The first thing I did was make my black lines, then let it rest in the freezer for about 10 minutes. 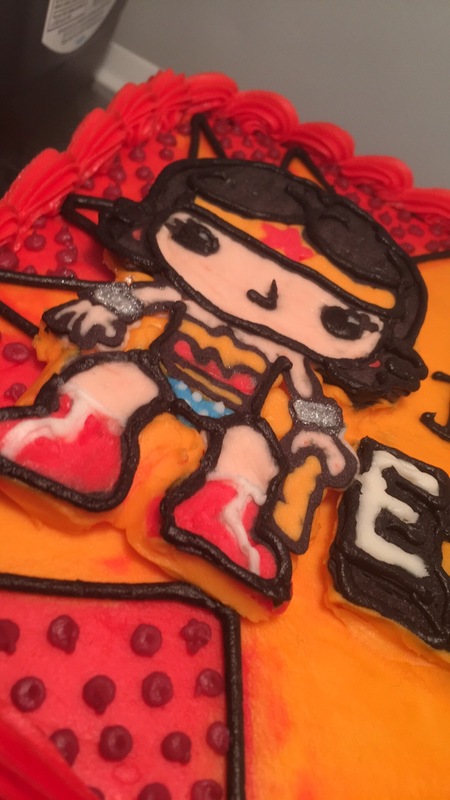 Then I did the white details, dots on her costume, and red star on Wonder Woman and filled in Batman’s white eyes. The next day, I softened some butter and made a small batch of buttercream. Believe it or not, I didn’t have enough buttercream! 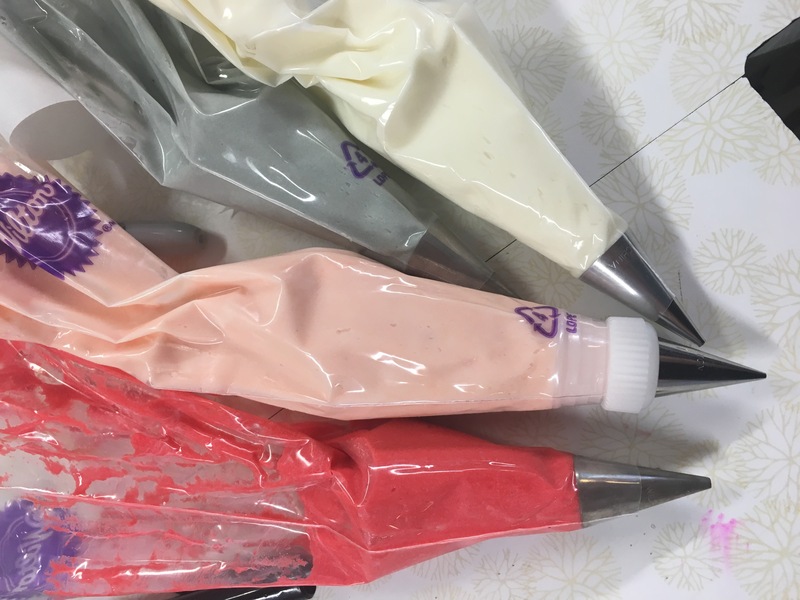 It is so hard to estimate your colors when making buttercream cakes and the consensus is that making too much of each color is better than not enough. So .. I didn’t have enough buttercream to crumb coat under my cake. 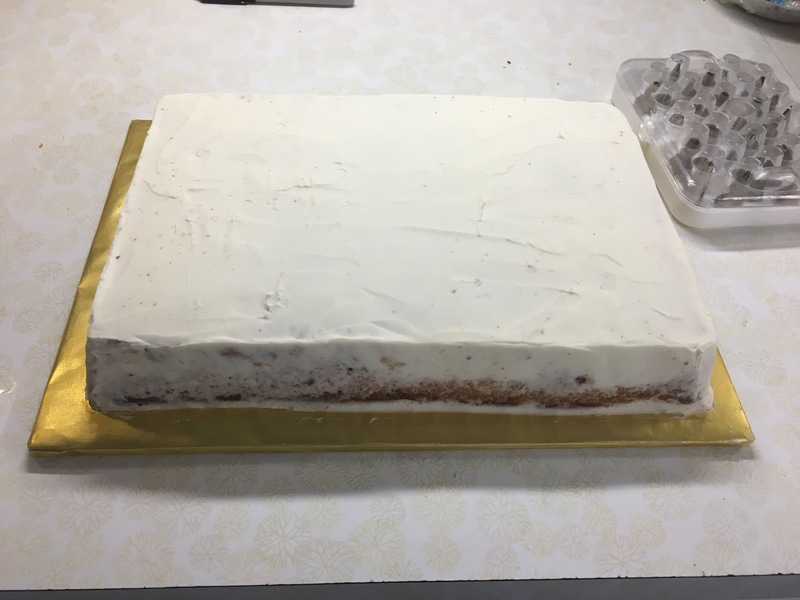 I did a thick crumb coat on the top of my cake that was more like a regular coat because I like to be generous with my buttercream. 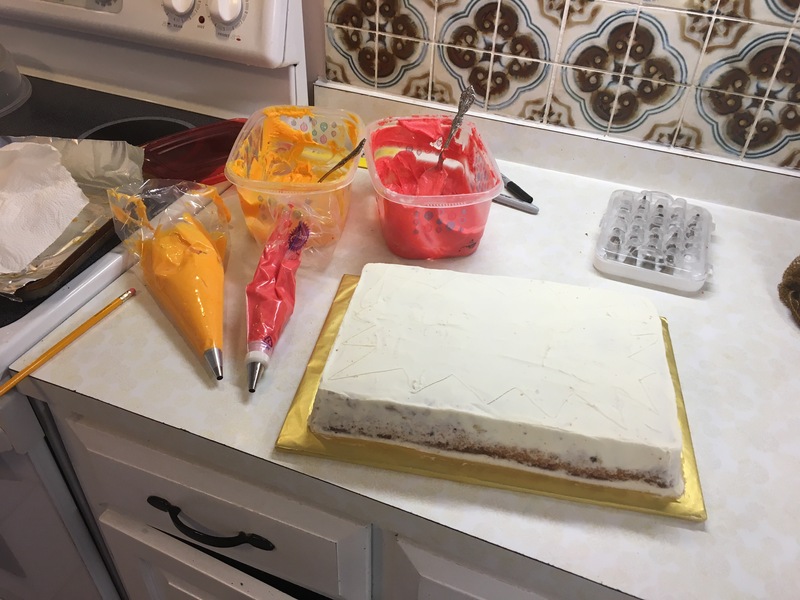 Then, after adding some fresh buttercream to the yellow and red to make sure I definitely had enough, I started the details on the top of the cake. I was going to do a starburst design, so I drew it into my crumb coat with a toothpick first. Next, I colored in the yellow and the red and tried to smooth it out and blend where they met together. Then, after letting the cake rest in the fridge for about 20 minutes, I smoothed it out with a Viva paper towel as best as I could. I scraped off and added to some areas to try and get it nice and even. Then I outlined it with a black line. I wanted to go for a comic book look. I don’t have many pictures of the rest of the steps. After letting it chill again, I added the blue on the sides. Then I got a number 1 tip and added the dark red dots to make it look even more like a comic book. 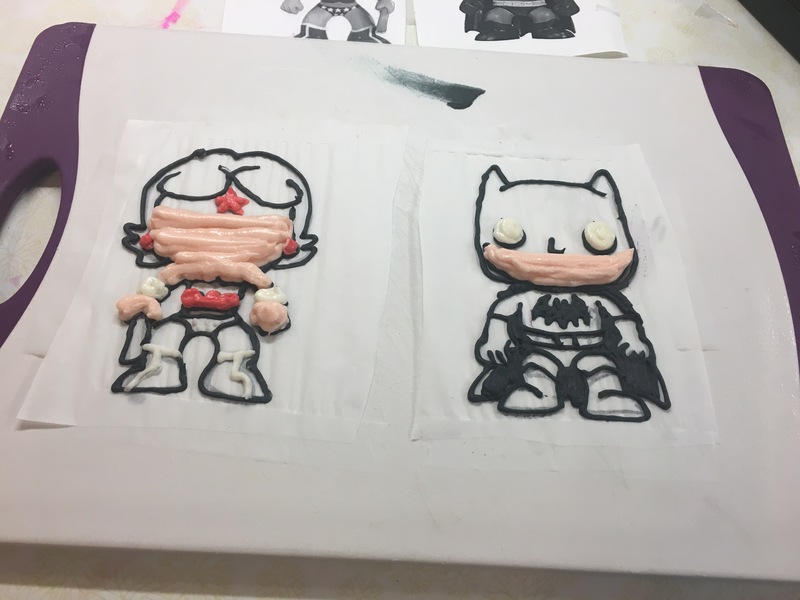 From there, I added my buttercream transfers, which turned out pretty well! 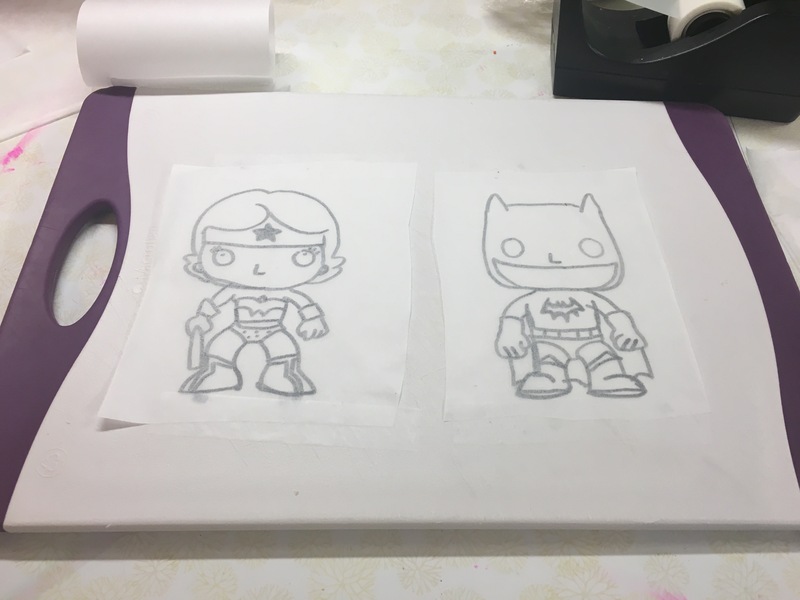 I smoothed them out with a paper towel, added white shine to Wonder Woman’s eyes and lined them a little bit more to really make them pop. I also made her name in a comic book font. I fixed that as best as I could. Then I wrote HAPPY BIRTHDAY free hand. I added my border with my number 18 tips. I also went back and added some silver luster dust to Wonder Woman’s cuffs. I didn’t paint it on. 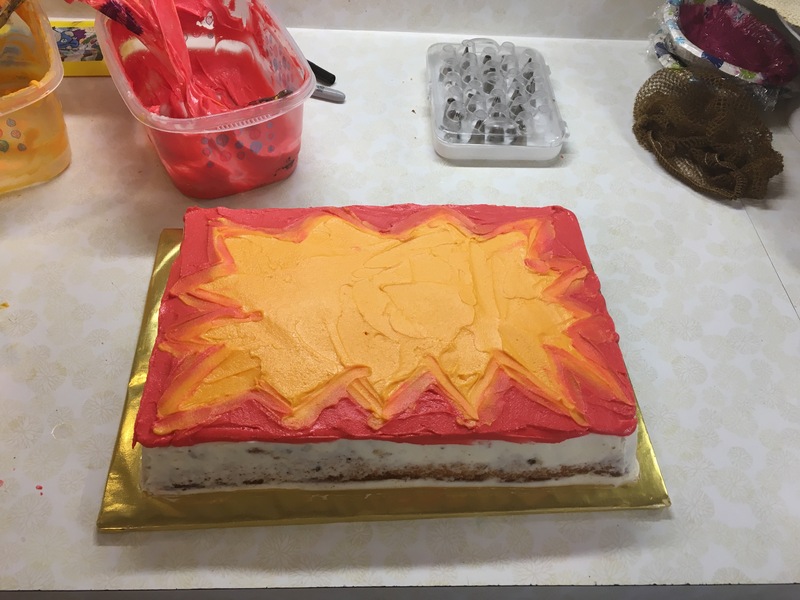 I just sort of dabbed it on (when the cake was chilled). And then I took my pic and was all done!! I know I have made more complicated cakes before — much more complicated. But there was something so nice about working in all-buttercream. And Ellie and her mom (and brother, too!) were so delighted! Did I mention this cake was one of my very favorite cakes, King Arthur Golden Vanilla Cake — with mini chocolate chips? Before covering it with buttercream, I poked it with a toothpick and added simple syrup to ensure that it stayed moist.